At the end of 2013, I knew that something had to change. I realized that I was wandering aimlessly through my work day with no real direction and, as a result, not getting as much done as I would have liked. I knew that I worked most effectively when I had a schedule, but making one up in Evernote every day with a corresponding online to-do list just wasn't cutting it. Throughout high school and college I consistently used a planner. If I didn't, I just wouldn't do my homework... I'd totally forget I had anything due and show up to class completely unprepared. So looking back, I'm not sure why I thought I outgrew this when I graduated. I may not have homework any more, but I have even MORE on my plate nowadays and I NEED a way to organize everything and make sure I stay on track. 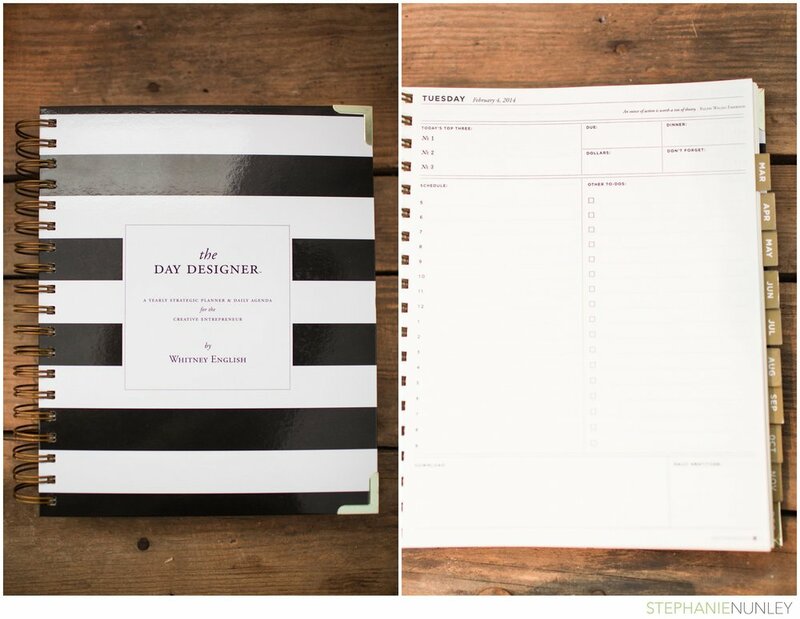 I began searching around and stumbled across several planners for creative entrepreneurs. I weighed the pros and cons of each (because I'm an INFORMED BUYER, ya'll. I don't make hasty purchases. :) and finally decided (after much Instagram stalking) that Whitney English's Day Designer was exactly what I was looking for. The Day Designer is a lot larger than most planners I'm used to using, but since it stays on my desk next to me 95% of the time, I'm okay with that. The covers are really thick, the gold corners look like they'll protect it in my bag, and the binding ring is super durable. I have no doubts it'll hold up well all year. The first few pages of the planner are worksheets designed to help you formulate your core values and goals to guide your business and life over the next year. They're incredibly helpful and thought-provoking, and demonstrate that Whitney is genuinely interested in helping creatives be successful in the long run. Immediately following is a year at a glance calendar, which I only use to write my scheduled weddings, engagement sessions, and trips. It's super helpful for me to be able to look on one page and see everything major I have coming up over the next year. 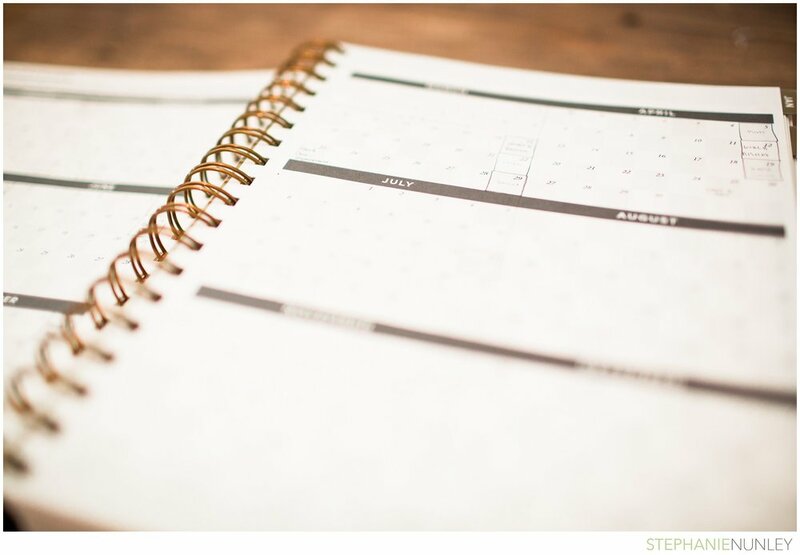 Each month has an overall month calendar, with spaces on the sides to write out overarching goals for the month that will help you pursue your passions and values. I love how there is a major focus on doing things intentionally, not just filling your days with random tasks that don't help you become the person you want to be. Finally, each day has it's own page to help you stay on track, which is honestly my favorite part. There are places to write out your schedule, daily to-do list, the top three things you want to accomplish, as well as smaller sections (due, dollars, dinner, don't forget, and download... lots of D's!) to help you organize your day. Finally, there's a spot each and every day to list something that you're grateful for. It's just a small way to cultivate a life of thankfulness, no matter what the day brings. I'm incredibly grateful for the Day Designer and the clarity & direction it allows me to have each day, and I'm excited to continue using it to plan my life & focus on what matters in 2014.